My friend, Margaret Banks will be debuting her new radio show The Margaret Banks Show on Mountain Talk 97 radio on February 27th! 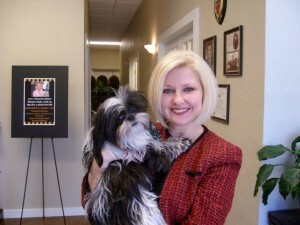 Margaret is the president of Margaret Banks & Company which is a financial advisement company. Margaret is the founder of the annual Women’s Financial Empowerment Summit and her show will be about issues that women are interested in. It will also be a lot of FUN! Mountain Talk 97.1 at 8:30 a.m. Central Time Saturday, February 27th. For those outside the listening area, go to www.mountaintalk97.com to hear the live broadcast, or click “Audio on Demand” to hear the show on your computer at your own convenience. 1. Saute onion, pepper, and garlic until beginning to soften. 3. Put half the cheese into a 9X13 baking pan, followed by the ham, the rest of the cheese, and the vegetables. Pour the egg mixture over the whole thing. 4. Bake 50-60 minutes, until top is golden brown and knife inserted into the center comes out clean. We have an abundance of eggs, thanks to our chicken population, so this recipe is most welcome. Please send my congratulations to your friend and the launch of her radio show! Oh, congrats on the co-hosting with your friend, how exciting for you both! Oh yes, we do love our casseroles! This one is perfect for an early covered dish gathering, it’s always a hit! OH YUMMMM I’m going to make this recipe for our Sunday family brunch! Thank you! this recipe looks great. I will use it next weekend for a brunch. Thanks for sharing this recipe I can hardly wait to try it.